A worker holds a self-made sign at Ford’s plant in Blanquefort, southwestern France. 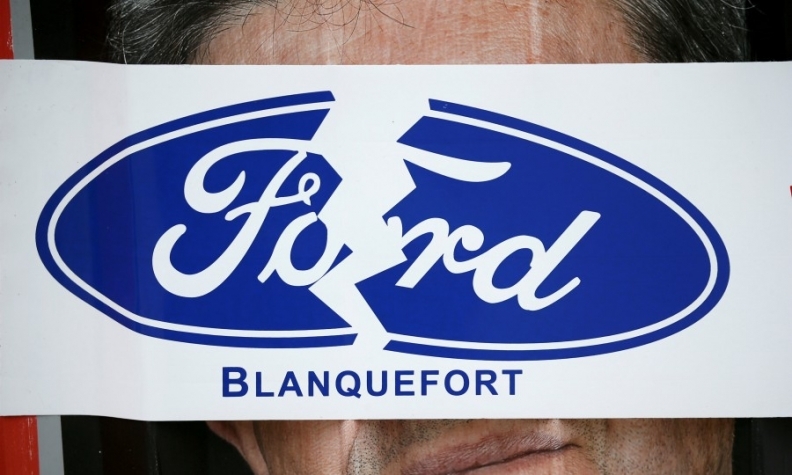 BORDEAUX, France -- Ford will end production at its Blanquefort plant in France by late August next year after rejecting a rescue deal for the factory, in a move which drew the ire of France's finance minister who accused the company of betraying workers to raise its share price. Ford said it had told the plant's works council that it had rejected the bid made by transmission supplier Punch Powerglide. "Despite thorough and rigorous talks over the past nine months, and the best efforts of both sides, the plan put forward by the potential buyer presents significant risks," Ford said in a statement to the works council. "We do not believe that the prospective buyer's plans offer the level of security or protection, or limit the risk of possible future job losses, that we would like for the employees," the company said. The likely job losses will be a blow for President Emmanuel Macron, coming at a time of public rebellion over his reforms to liberalize the economy, including an easing of labor laws, and battles to haul down the country's stubbornly high unemployment. Finance Minister Bruno Le Maire in September had described Punch Powerglide as a "credible, solid buyer." Le Maire reacted angrily to Ford's decision and called on the U.S. company to change its mind. "I am revolted, I am sickened by this decision whose only justification is for Ford to get its shares to rise on the stock market," Le Maire told the French Senate on Thursday. Le Maire said he had learned of Ford’s decision in a statement earlier in the day after the company had refused to answer his telephone calls for several days. For the last three days I have been looking to talk to them, and they didn't even have the courage to talk to the minister of finance and economy over the phone," he said. Le Maire’s comments are an uncharacteristic public admonishment of a foreign company from a French minister. Punch Powerglide had made an offer to take over the factory and preserve 400 jobs with 15 million euros ($17 million) of support from the French state and local authorities.